Business Insider reports that the average cost of Thanksgiving dinner is only $49.41 for 10 people. Anyone that has ever hosted a Thanksgiving dinner for family or friends knows that in reality, the cost is quite more. When you factor in place settings, decorations, and all of the food, the total is actually closer to $100-$200 for some families. While Thanksgiving is expensive, what’s worse is that the most expensive holiday, Christmas, comes shortly after. 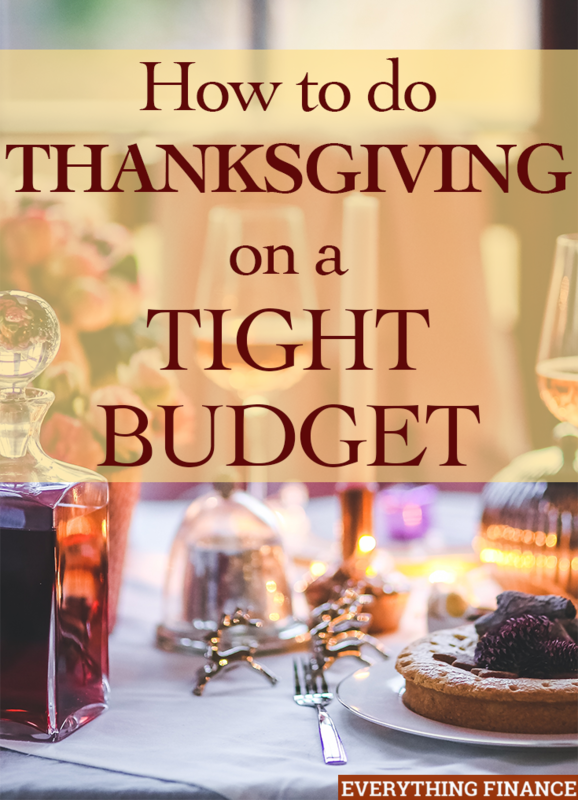 Here are some tips to keep your Thanksgiving on a tight budget so you won’t feel the financial squeeze during the holiday season. The classic dishes of turkey, pumpkin pie, and green bean casserole are the cheapest dishes to make. Most grocery stores offer highly discounted prices on the classics during the holidays to attract more customers. Be sure to buy extra of everything to avoid any last-minute trips to the store the day before or the day of Thanksgiving. You can always donate extras to local food drives. There’s no sense in making everything by yourself from scratch. That’s a lot of work for anyone to do. Instead, ask each individual or family to bring one side dish or dessert to share. This will take a lot of stress off of you, and will help divide the food costs among the guests. For individuals that aren’t great in the kitchen, like your bachelor brother-in-law, ask them to bring drinks or paper plates. Every small contribution helps reduce your overall costs. I know I said to stick with the classics, but if a turkey dinner is really not your thing, then don’t worry. A platter of lasagna feeds a crowd and costs around $20 to make. You don’t have to sit down to turkey dinner to enjoy your Thanksgiving. One year my mom, sister, and I helped at a food shelter, and that still remains one of my favorite memories. Many years we would skip the traditional dinner all together for a movie. After hosting a lovely Thanksgiving dinner, you’ll probably be exhausted for several days after. This might result in extra Starbucks runs or eating out. Combat the cost now by preparing a few freezer meals in advance (if you don’t anticipate having leftovers). It might even be worth the cost of hiring a maid to come in after the celebration to get the house back order. For a few hours of cleaning, the typical charge is about $60-$80, depending on the size of your home. You can always clean just the bottom level of your home if you live in a two-story house. I know I would rather spend $80 to get my house back in order and restore my sanity rather than have my money go toward greasy fast food bought out of stress. Food is usually the main star at Thanksgiving, so don’t feel the need to have a lot of other decorations. You can always decorate with pine cones or assemble leaves underneath in a vase with a candle placed on top. A white tablecloth can get a new look with an inexpensive DIY burlap runner. Remember what Thanksgiving is really about. It’s about spending quality time with the ones that you love. You don’t need to go into debt just to put on the perfect Thanksgiving celebration. What does your Thanksgiving meal consist of? Do you stick with tradition, or create your own? Black Friday vs Cyber Monday: Which Sales are REALLY Better?